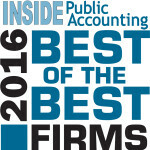 The 2016 INSIDE Public Accounting (IPA) Annual Survey and Analysis of Firms is now open to all accounting firms in North America. The results of the annual survey is the IPA National Benchmarking Report, the IPA 100, 200 and 300 firms ranking, and the coveted IPA Best of the Best firms. If you would like to participate, please contact our office. THE 2016 IPA SURVEY AND THE INTERNAL OPERATIONAL SURVEYS ARE AVAILABLE FOR COMPLETION. Your firm must complete the IPA Survey and Analysis form in order to participate in any of the internal operational surveys. If you would like to participate, contact our office. Gain a competitive advantage and grow your firm with industry insight from the independent benchmarking leader in the nation. The opportunity to be included in the largest annual management of an accounting practice (MAP) survey in the country. To be benchmarked with more than 500+ firms nationwide and potentially be ranked among this year’s top firms in the: IPA 100, IPA 200, IPA 300 and the coveted IPA Best of the Best Firms in the nation. If you participate in the surveys, you will receive a complimentary copy of the August 2016 issue of the award-winning INSIDE Pubic Accounting newsletter. This issue highlights the annual IPA 100 firm rankings, along with a detailed financial and operational analysis of the rankings. 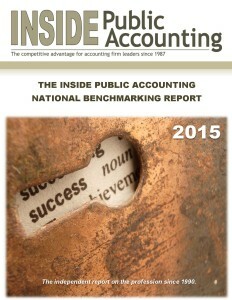 A electronic complimentary copy of the 2016 Executive Summary, of the IPA National Benchmarking Report. If you participate in any or all of the IO surveys, you will also receive a complimentary executive summary when published in late summer. You will receive preferred pricing on the 2016 IPA National Benchmarking Report, the IO Reports, and other benchmarking items. You will get preference for selection in articles written by IPA throughout the year, (an excellent opportunity to market your firm). If you would like to participate, please contact our office. All confidential firm data, including salaries, compensation, income, etc., will be held in strict confidence. Salaries, compensation and sensitive data, such as income, revenues by niche, etc., will NOT be shared or publicized. We take extreme pride in our ability to collect this data to assist the profession and are now celebrating 26 years surveying accounting firms across the globe. Please contact IPA at survey@plattgroupllc.com with any concerns or questions. IPA conducts a thorough review of each survey submission for commonly missed areas and for any and all errors. IPA will contact the person / contact named on the submitted survey form for any and all clarifications / updates. Some data, such as firm name, MP(s) name, firm net revenue, and organic growth may appear in the IPA Newsletter (if accolades are given). IPA ASSOCIATION PARTNERSHIPS: INSIDE Public Accounting is pleased to partner with the following associations to provide survey and benchmarking services for their member firms: The Alliott Group, CPAmerica International, DFK International, LEA Global, Moore Stephens North America and PrimeGlobal. Please contact The Platt Group / IPA with any questions at (317) 733-1920.